When you have a baby, life suddenly gets insanely busy. Between diaper changes, feedings and night wakings, who has time to worry about baby teeth? They don’t really matter anyway, right? Wrong! Your child’s baby teeth actually matter very much, and if he is over one year old and you haven’t taken him to the dentist, it is time to get serious about her oral health. According to Kool Smiles, when your baby’s first tooth appears or turns one year old, you should start thinking about making that first appointment. The first visit is more about getting your child used to the dentist and to teach you about how to properly care for their teeth. However, Web MD adds that if you have weaned your little one from the bottle and he or she doesn’t eat or drink anything during the night then you should be good to wait until age two). 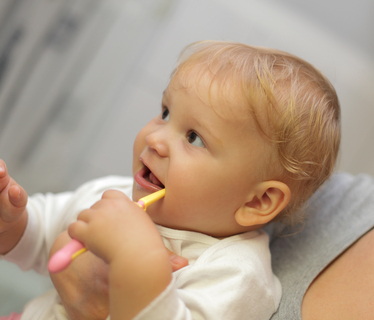 Well, you can go to a regular dentist, but that may be doing your child a disservice. Pediatric dentists have additional training in child development so they know how to better interact with your child and make the visit as pleasant as possible. Not to mention, most pediatric dentists have fun offices that make the experience more enjoyable for your little one. There are likely many pediatric dentists in your area and it can be overwhelming to choose just one. The best place to start is with your pediatrician. Ask for a referral and go from there. You can arrange a meet-and-greet with the pediatric dentist before committing if it makes you feel more comfortable. Remember, if at any point you decide the pediatric dentist is not right for your family, never hesitate to switch to a different one. First, breathe a sigh of relief because this is perfectly normal. A stranger is putting his hands in your child’s mouth and they don’t really understand why. Web MD believes that the best thing you can do is stay calm yourself. Your child takes cues from you more than you may realize. You also need to use your words wisely when talking about the dentist. Avoid negative words, like pain and hurt, and focus on the positive aspects of the dentist, like the healthy and strong teeth your child will have. You can even take your little one along to your dentist appointment so they can see what it’s all about. The biggest thing you can do is show excitement yourself. If you are excited to take your child to the dentist, chances are they’ll be excited to be there. You can also employ the help of the abundance of kids’ books and television shows that teach about what your child can expect at the dentist. Parents.com even suggests staging a practice session for your little one, in which you are the dentist. Have your child put his head on your lap, open wide and count his teeth with your fingers.